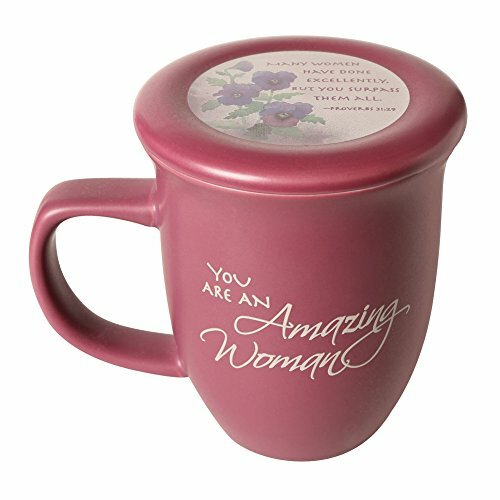 FOR THE AMAZING WOMAN - Uplift yourself every morning with this "You are an Amazing Women," because every women deserves a reminder that she is. GORGEOUS PAINTED CERAMIC - Painted in a rich pink with the inspirational quote "Many women have doe excellently, but you surpass them all" on the lip. COASTER DOUBLES AS A LID - Use it both to rest your cup on and to keep your drink warm. Painted with a floral background and a quote from Proverbs 31:29. LARGE MUG - Enough for an entire morning's worth of coffee or tea, it holds 14 ounces of your favorite hot beverage. A GREAT GIFT - Get one for the amazing mom, wife, daughter, or friend in your life. If you have any questions about this product by Abbey Press, contact us by completing and submitting the form below. If you are looking for a specif part number, please include it with your message.